The tranquil Tamar River is nestled in the historic Tamar Valley in Northern Tasmania. Noted for its nationally historic significance, prolific wildlife and inspiring natural beauty, a cruise on the Tamar is a truly unforgettable experience. 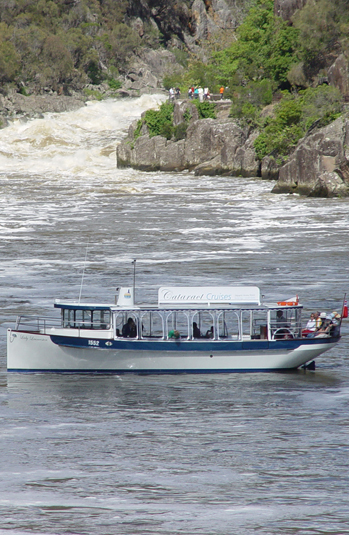 Our parent company, the multi award winning Tamar River Cruises offers daily cruises of discovery into Launceston's magnificent Cataract Gorge, riverfront precinct and Tamar River. Highlights include Tamar Island, historical buildings including churches, hotels and significant homesteads. Sample the rich diversity of the river as we cruise past quant riverfront communities, abundant local vineyards and farms to the notable architectural feature; the Batman Bridge. The valley is steeped with romance and studded with bushrangers, explorers, gold diggers and events of national significance. The Tamar River is a sheltered waterway and is Australia's longest navigable estuary. More than 70km long its many natural coves and protected inlets provide sanctuary for thousands of native water birds. We share the river with wonderful wildlife including black swans, ducks, pelicans and of course, our company emblem, the stunning, white bellied sea eagle.